A Library Journal Best Book of 2006! a breath of fresh air." "The kind of book that makes you want to hunker down on a chilly day in a comfy chair and read straight through 'til dark. . . . This [is a] poignant, heart-tugging story about a single woman and a little girl who develop a heart-tugging bond." "A touching, triumphant story of the power and variety and responsibility of love. A joy to read, filled with characters you wish you knew in real life. 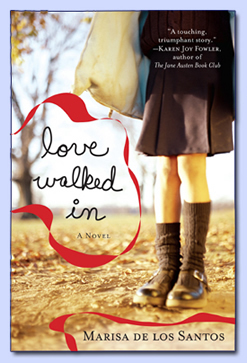 Love Walked In is every bit as engaging as the classic movies Marisa de los Santos lovingly invokes." "Exquisite and stylish, Love Walked In proves that love in all of its forms--romantic, friendship, familial--is all around us." is as luminous as the silver screen." a bone-deep examination of inner lives, the bonds between women, and the prospects of borderline madness." "This is a book that will be passed from friend to friend with the words, 'You have to read this.'"